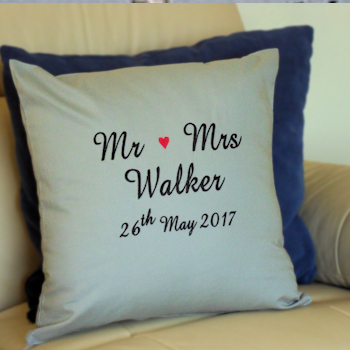 Wedding anniversary cushion with names separated by a little love heart embroidered onto your choice of cushion colour to make an unique gift for a special couple. Approx 41cm or 16 inch square 100% cotton cushion cover in your choice of colour. Personalised names are beautifully sewn in a text thread colour and letter font style of your choice to make a fantastic bespoke cushion gift.